Grease the musical is going on a new UK tour opening at the Leeds Grand Theatre in June 2019. 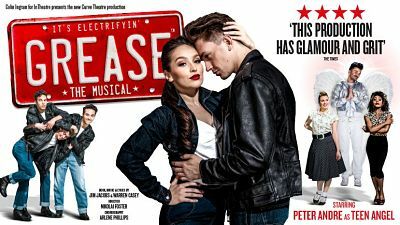 The Leicester Curve production of Jim Jacobs and Warren Casey's new touring production of the musical Grease will be directed by the Curve's Nikolai Foster and choreographed by Arlene Phillips. Peter Andre is to star as Teen Angel who appears at the dance at Rydell High School when he performs his big number Beauty School Dropout on certain dates on the tour which is currently ending in Bromley in October 2019. Dan Partridge, Martha Kirby, Louis Gaunt and Rhianne-Louise McCaulsky will star as Danny, Sandy, Kenickie and Rizzo respectively. They join the previously announced Peter Andre playing Teen Angel at most performances. Also in the cast are Jordan Abey/Doody, Ryan Anderson/Roger, Damian Buhagiar/Sonny, Eloise Davies/Frenchy, Natalie Woods/Jan, Tara Sweeting/Marty, Dale White/Eugene, Jessica Croll/Patty Simcox, Corinna Powlesland/Miss Lynch, Abigail Climer/Cha Cha, Darren Bennett/Vince Fontaine and Will Haswell/Johnny Casino. Completing the cast are Thea Bunting/Cynthia, Emily Beth Harrington/Carly, Jonathan Hermosa Lopez/Bobby, Dom Hutcheson/Mickey, Ruby May Martinwood/Sofia and Lindsay McAllister /Donna Sue. The musical Grease is a story of love, friendship and growing up with well known musical numbers and fabulous dance routines.Songs include "You're the One That I Want", "Summer Nights", "We Go Together" and "Look At Me I'm Sandra Dee"It is an adaptation of the film of the same name starring John Travolta and Olivia Newton John. Sandy is an Australian spending her summer holidays in America where she falls in love with uber-cool Danny Zuko. Their love affair ends when Sandy is despatched back to Australia with her parents, but fate intervenes and Sandy's parents move to America. Sandy ends up at Rydell High - the same school as Danny, but he has a reputation to maintain and can't be seen going out with prim and proper Sandy. Sandy joins the feisty Pink Ladies but can't forget about her summer with Danny. Danny is similarly love struck and after many twists and turns, Sandy transforms herself, leaving behind her good girl persona so that she and Danny are finally united.